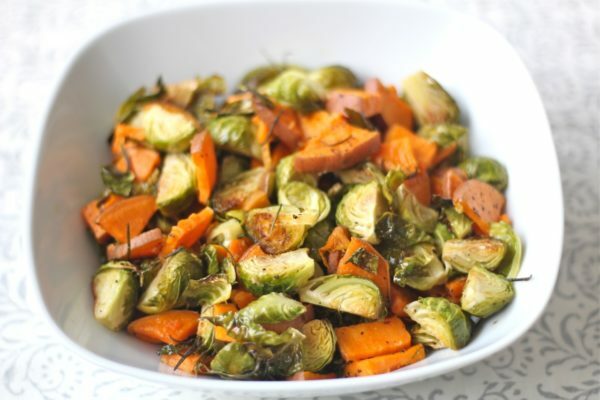 Roasted sweet potatoes and brussels sprouts are an amazing side dish for any occasion. This recipe works well for a simple weeknight dinner paired with your favorite protein, but also for a fancy holiday meal. On top of tasting delicious, this side dish is very healthy and packed with nutrients. So try this dish for your next thanksgiving dinner or holiday party. 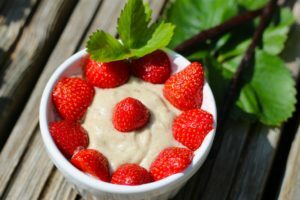 Not only will your guests love the flavor, you will also have a healthier holiday season. When I changed my diet to follow the autoimmune protocol and really got into cooking, roasted sweet potatoes and brussels sprouts were my first go-to food. It is still one of my all time favorites, especially for the colder months of the year. I personally love brussels sprouts but it seems like you either love them or hate them. This recipe is a very good way to introduce them even to people that are skeptical. I have gotten a lot of positive feedback from people that normally don’t like them. So if you are not a fan of steamed brussels sprouts, give this recipe a chance. They taste very different when roasted. And since brussels sprouts are rich in many important nutrients it is worth incorporating them into your diet. This is also a very good recipe to make large portions of and save some of it for the next day. I always intend to make a lot but end up eating most of it because it is so delicious. All you need for this recipe is sweet potatoes, brussels sprouts, garlic, olive oil, fresh rosemary, salt and pepper. Even though it has to be in the oven for approximately 40 minutes, your active prep time is about 10 minutes. I recommend to use a very sharp quality knife to cut the sweet potatoes. If you want large portions of your side dish, this recipe will be for 2 people. 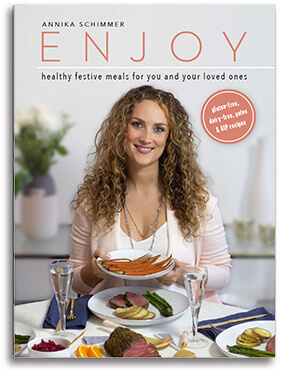 For a dinner with multiple side dishes, like for example a holiday meal, the recipe will work for 4 people. Since thanksgiving is right around the corner, put the ingredients on your shopping list and make it part of your thanksgiving meal. Roasted sweet potatoes and brussels sprouts are a simple, healthy yet delicious side dish for any occasion. Perfect for a thanksgiving or holiday dinner. Cut the veggies into small pieces. Place on a large baking sheet. Drizzle with olive oil, minced garlic, salt, pepper. 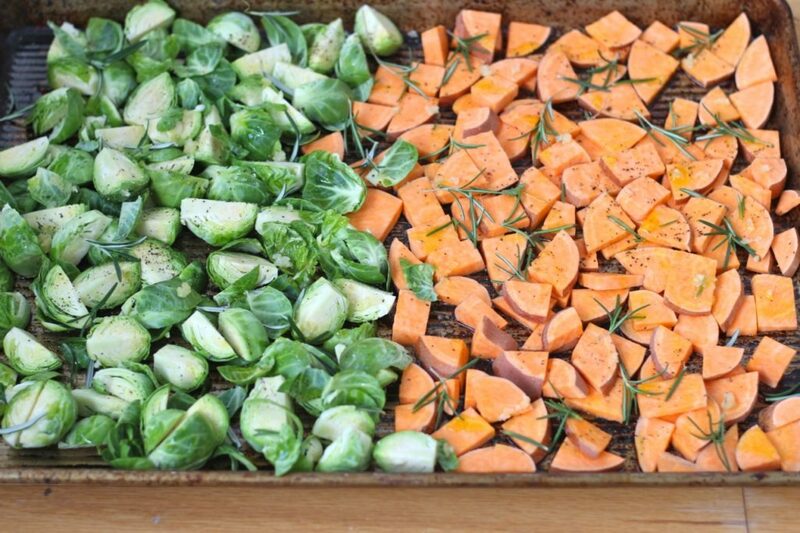 Remove the rosemary leaves with your fingers and sprinkle evenly on the sweet potatoes and brussels sprouts. Roast in the middle of the oven for about 40 minutes or until golden browned. Toss after 20 minutes and make sure all veggies are covered with oil. If the veggies seem a bit dry add a little extra olive oil. 1.If you want large portions of your side dish, this recipe will be for 2 people. For a dinner with multiple side dishes, like for example a holiday meal, the recipe will work for 4 people. 2. If you are roasting meat in the oven at the same time, place the meat on the lowest rack and the sweet potatoes and brussels sprouts on the highest. Add the veggies in when the meat still has 40 minutes of cooking time left.